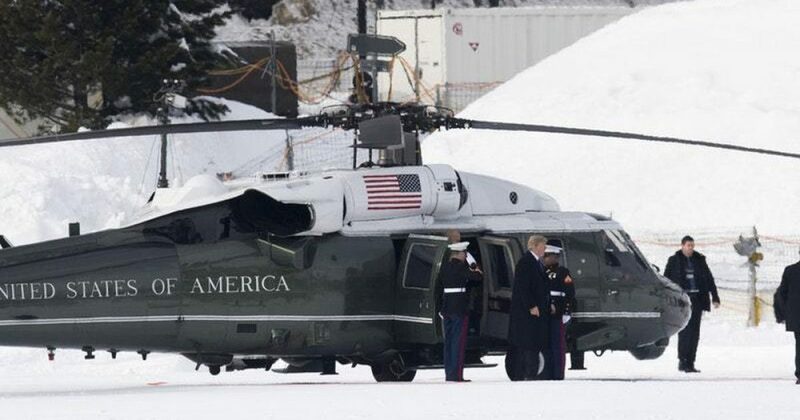 President Trump arrived to a rock star reception in Davos for the World Economic Forum, but a rough road ahead is predicted for the US president as many foreign leaders threaten to protest his attendance. It seems foreign leaders do not exactly favor President Trump’s America First economic policy, which they refer to indignantly as “protectionist” (as though protecting your own people is a bad thing). They prefer the old American economic policy where US leaders were expected to favor every other nation on earth before the United States. Sorry about your luck, folks! Get used to it. Trump, much of whose base back home views the meeting as a conference of global elitists, is expected to meet with world leaders, attend a reception, host a dinner for European business executives and give a keynote address Friday. Trump should not expect a warm welcome after spending much of his first year as president pushing the pro-America agenda, in rhetoric as well as trade policy. Even before his arrival, world leaders signaled veiled displeasure with the American president’s policies. German Chancellor Angela Merkel, in her address Wednesday, warned of the dangers of protectionism, and her French counterpart, Emmanuel Macron, spoke of a “shared framework” and shared responsibilities among nations. “We are seeing nationalism, populism and in a lot of countries a polarized atmosphere,” Merkel said Wednesday, in a speech at Davos. “We believe that isolation won’t help us. We believe we need to cooperate, that protectionism is not the answer. In his keynote address, Indian Prime Minister Narendra Modi named “protectionism” as a key global challenge, along with climate change and terrorism. Trump also offended many from the African delegation, with his alleged recent off-the-record comment disparaging “s—hole countries,” a remark that was purportedly aimed at Haiti and nations in Africa. That has sparked speculation that some may walk out on Trump’s address, a prospect raised by Business Leadership South Africa CEO Bonang Mohale in an open letter. Others have suggested leaving Trump’s speech in progress may make a more powerful statement. Trump’s is the first visit by a sitting president to summit in Davos since Bill Clinton appeared in 2000. His decision to attend was a surprise, given his protectionist policies. Trump has withdrawn from the Trans-Pacific Partnership trade agreement and demanded changes to the North American Free Trade Agreement. “When we grow, the world grows; when the world grows, we grow. We’re part of it, and we’re part of a world economy. And the president believes that,” he said, according to Reuters. I love that! “America first is not America alone.” Perfectly sums up the Trump economic agenda.